Ales Moisturizer Review: Is It Safe And Effective? 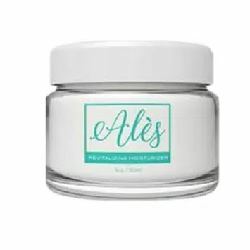 Ales Moisturizer is an anti-aging skincare solution that can address the most troublesome signs of aging like wrinkles, fine lines, and facial creases. The moisturizer is new to the market and is currently available for a free trial for people who are willing to see how it works. In this Ales Moisturizer review, you will discover all the basic details about this product. About Ales Moisturizer – Does It Really Work? The manufacturer of Ales Moisturizer is unnamed, even on their official website. There is no information as to when the company was established, its track record, the other formulations they have developed and what their mission and vision are. Boosts production of elastin and collagen. Works fast to promote young and ageless looking skin. Improves skin’s hydration to achieve a more supple and healthier skin surface. What Are The Ingredients In Ales Moisturizer? Peptides: These substances can be able to fill in the damaged areas in the skin. It can fill in the sparse areas that we call wrinkles and fine lines to bring back the youthful appearance and radiant glow of the skin. By filling in these sparse areas, the skin gets tighter, and the look of wrinkles and fine lines are diminished. Apart from this “powerful” ingredient, nothing else is listed on the site which is quite rare since a moisturizer would require lots of additives, vehicles and other excipients for it to be properly formulated. In addition to that, the term peptide can be quite vague because there are different types of peptides that can be used in the skin care industry. For best results, gently smooth a small amount of Ales Moisturizer on your face, neck, and chest. Use the product day and night after you have cleansed the skin. Avoid contact with eyes and lips as much as possible. It can promote the production of collagen and elastin. The moisturizer is formulated to improve the appearance and feel of the skin. According to the claims, the moisturizer works quickly. There are no user reviews about it. No clinical studies can back up the moisturizer’s claims. Does Ales Moisturizer Have Any Side-Effects? As of this writing, there are no reviews or clinical studies that state that Ales Moisturizer side-effects. But since the moisturizer really does not have any reviews or studies and its ingredient list is also not fully stated, it is not safe to say that its use will be free of side-effects. It would be a risk for you to try a cream if you don’t know what its contents are or how it really works. Ales Moisturizer has so many attractive claims and offers, like the free trial. But before you consider availing of their free trial, please take note that the ingredients of the formulation are not specified so there’s a risk that it contains an ingredient that you are allergic to or may be harmful to your skin.